In one of my very first beauty posts on Fashion Mumblr, (Urban Decay, City Living Vs Your Skin) I admitted that since moving to London, my skin has suffered; “I have begrudgingly become the bearer of dull, dry skin and lines lacing my eye-corners and forehead (I’m 21 – this is NOT okay).” I was also surprised to hear a few other twenty-somethings admitting that ‘crows feet’ and ‘frown lines’ were amongst their biggest skincare concerns at the Clinique Skinnovation event recently, so I began the hunt for a lifting cream that I could easily slot into my daily routine. I should have known that the answer would be Origins! Origins new anti-aging elixir promises results in two weeks – the cream has been hailed as giving results similar to ‘a discreet doctor’s fix’. Thankfully i’m definitely NOT at that stage yet, but not averse to starting a more natural route to rejuvenating my skin, so i’ve started applying the Origins Plantscription Powerful Lifting Cream each morning (now that my GinZing has run out – boohoo!) as well as in the evenings after I have removed my makeup. 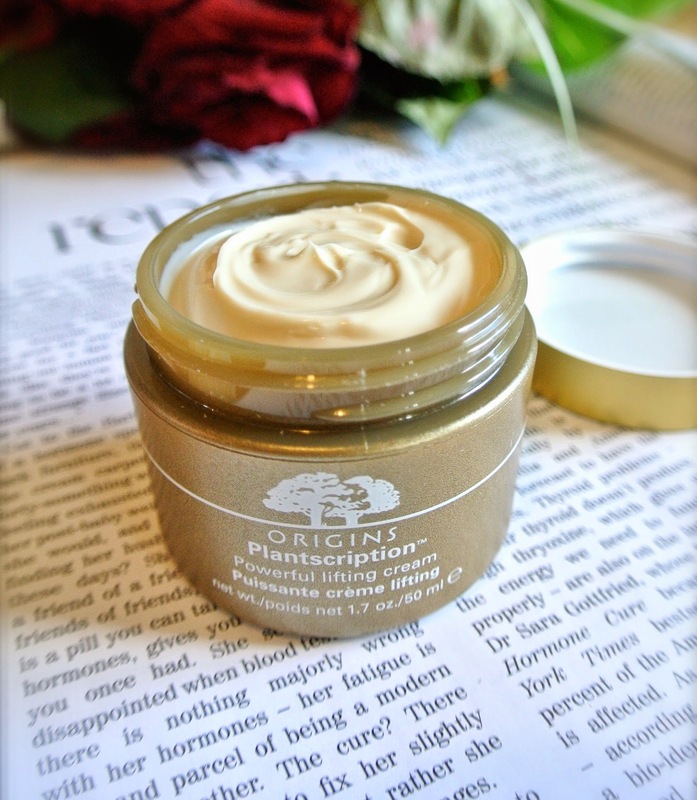 This cream promises to counteract tired, slack skin with Origin’s exotic mix of plant ingredients. The cream works to restore collagen and tauten elastic – so even if ‘wrinkles’ are not a skin concern for you, this cream can be used to firm, and give an even definition on your face and neck. It’s rich and luxurious but it absorbs well, my skin feels and looks smooth and hydrated, with no oily feeling and gives a great base for my foundation. With regards to long term results, I can not offer an honest opinion; the lines around my eyes seem to come and go depending on tiredness and I’ve only just reached the two-week mark for using the cream. I do however find the cream to give my skin a taut feeling, and the cream instantly blurs any lines on my face before applying makeup. My skin gets quite oily during the day, so I didn’t apply another moisturising cream, but if your skin is dry I would recommend adding this to your daily routing, instead of swapping your moisturiser for it! Would you start to use a lifting cream yet? Have you tried any?